Congratulations on considering to join our growing list of clients that have already had this procedure performed. Semi-permanent makeup has literally changed the lives of some clients that have lived with problematic brows that take forever to maintain, or in rare cases have little or no brows of their own. The positive effects of permanent make up are countless. No longer will you need to "put on" your face in the morning. Feel comfortable knowing that you are looking your best at all times. Each brow that we apply is different because all face shapes are different. Special care is put into the creation of exactly the shape, design and color you desire. HQ Beauty Care's technicians are highly trained and are certified in the art of permanent makeup by some of the most respected training academies available. 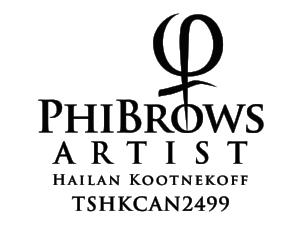 We offer a consultation prior to the application that will give you a clear image of what your brows will look like after they are applied. The procedure is made painless through the application of a numbing cream that reduces any discomfort you may feel. Please browse through the options available to you below and let us know which one you are interested in. Drop us a email or a call if you have any specific questions that we can help answer. We would be happy to help you. I am certified, insured and approved by Alberta Health Services. The process from start to finish typically takes 2 to 3 hours. the manual hand application of the semi-permanent tattooing. Microblading is a technique that is applied by hand without use of a machine. Micro-Blade feathering creates a very natural, life like looking brow. Each stroke creates a beautiful looking hair line that's easily mistaken for your own natural hair. Each stroke creates hair like impressions by implanting pigment in a line under the skin. HQ Beauty Care uses a unique method that is only recently been introduced to North America. The powder fill method involves the application of thousands of tiny little dots of pigment, inserted into the skin, gradually building up a color and a defined shape. It is the more traditional method of cosmetic tattoo. This service combines both Ombre powder shading using a machine and free hand micro-blade feathering application for a stunningly sharp and dramatic look. Touch ups are offered from two months and onward. The first touch up is free with all my brow work within two months. Please check the individual prices by clicking the price and book button below.